WASHINGTON, DC, January 2, 2013 (ENS) – With a vote of 257-167 late Tuesday night, the House of Representatives concurred with the Senate in passing a bill to avert the fiscal cliff that includes tax credit extensions for wind energy and biodiesel, cellulosic ethanol and electric vehicles, energy-efficient new homes and appliances. The American Taxpayer Relief Act of 2012, which keeps income taxes low for the middle class while raising rates on the rich, now moves to President Barack Obama for his expected signature. It was also a cliff for the wind energy industry, where uncertainty about extension of the tax credit has caused thousands of layoffs over the past several months as companies idled factories due to a dearth of orders for 2013. The extension of the wind energy Production Tax Credit, and Investment Tax Credits for community and offshore projects, will allow continued growth of the energy source that installed the most new electrical generating capacity in America last year, with factories or wind farms in all 50 states. 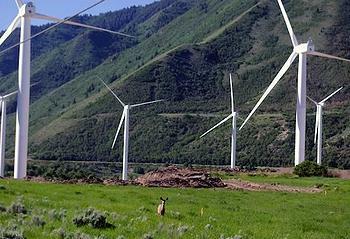 The extensions cover all wind projects that start construction in 2013. Companies that manufacture wind turbines and install them sought that definition to allow for the 18-24 months it takes to develop a new wind farm. Leaders of the Senate Finance Committee included that version in a “tax extenders” package they assembled in August, which made it into the overall fiscal cliff deal that now has passed both houses of Congress. Wind set a new record in 2012 by installing 44 percent of all new electrical generating capacity in America, according to the Energy Information Administration, leading the electric sector compared with 30 percent for natural gas, and lesser amounts for coal and other sources. Yet, half the American jobs in wind energy – 37,000 out of 75,000 – and hundreds of U.S. factories in the supply chain would have been at stake had the tax credit been allowed to expire, according to a study by Navigant Consulting. “On behalf of all the people working in wind energy manufacturing facilities, their families, and all the communities that benefit, we thank President Obama and all the Members of the House and Senate who had the foresight to extend this successful policy, so wind projects can continue to be developed in 2013 and 2014,” said Denise Bode, outgoing CEO of the American Wind Energy Association, AWEA. 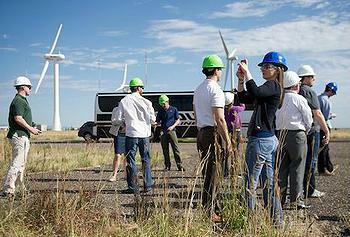 “Now we can continue to provide America with more clean, affordable, homegrown energy, and keep growing a new manufacturing sector that’s now making nearly 70 percent of our wind turbines in the U.S.A.,” said Rob Gramlich, who today becomes AWEA’s interim CEO now that Bode has returned to private practice as a tax attorney. Uncertain federal policies have caused a “boom-bust” cycle in U.S. wind energy development for over a decade as each year the question of the tax production credit extension arises. In the closing days of this year’s lame duck session of Congress, wind energy workers have been posting videos to tell their stories of working in the new industry. The 2,000 companies that belong to AWEA have sent many delegations to Capitol Hill, invited Members of Congress on tours of wind farms and factories, and delivered hundreds of thousands of letters from constituents. The U.S. biodiesel industry applauded the fiscal package that reinstates the biodiesel tax incentive for 2012 and 2013. The biodiesel tax incentive expired on December 31, 2011. A recent study found that the industry would have produced an additional 300 million gallons this year with the tax incentive in place. That would have supported some 19,213 additional jobs, for a total of 83,258 jobs supported by the industry nationwide, according to the study, conducted by Cardno Entrix, an international economics consulting firm. 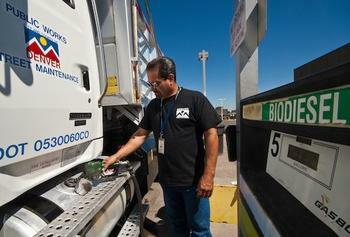 “It’s been a long year with a lot of missed opportunity and lost jobs in the biodiesel industry. But we’re pleased that Congress has finally approved an extension so that we can get production back on track,” said Anne Steckel, vice president of federal affairs at the National Biodiesel Board, the U.S. biodiesel trade association. Looking ahead to 2013, the Cardno Entrix study found that the industry would support some 112,078 jobs nationally with the tax credit in place, but only 81,977 jobs without it. The return of the incentive also is projected to increase household income by some $1.6 billion next year while supporting an additional $3.1 billion in Gross Domestic Product. At the same time, she said, biodiesel reduces tailpipe and greenhouse gas emissions. “This is important not just for jobs but for diversifying our energy supplies, improving our energy security and reducing costly emissions,” Steckel said. Made from an increasingly diverse mix of resources such as recycled cooking oil, soybean oil and animal fats, biodiesel is a renewable, cleaner-burning diesel replacement that can be used in existing diesel engines without modification. The biodiesel industry has production plants in nearly every state across the country. It is the first and only commercial-scale fuel produced across the United States to meet the U.S. Environmental Protection Agency’s definition as an Advanced Biofuel. That means the EPA has determined that burning biodiesel reduces greenhouse gas emissions by more than 50 percent when compared with petroleum diesel. The $1-per-gallon biodiesel tax incentive was first implemented in 2005. Congress has allowed it to lapse twice, in 2010 and again in 2012. Under the legislation first passed by the Senate on Monday and approved by the House late Tuesday night, the biodiesel tax incentive will be reinstated retroactively to January 1, 2012 and through the end of 2013. Tax extensions for production of cellulosic ethanol from plant materials, and for electric vehicles, energy-efficient new homes and appliances are included in the bill, and for tax purposes algae will now be treated as a qualified feedstock for production of biofuel.